Islay is a small island with a population count hovering around 3,300 people. Many of them are working in the whisky and tourism industry and so it’s logical that some of them rose to fame and can even be celebrities for whisky lovers. But not all Islay celebrities are human, as some would argue that Crofter, a dog owned by Steve Bavin, now of Islay Ales and formerly of Bruichladdich distillery, can also be considered as a local celebrity, especially during the yearly Feis pilgrimage. 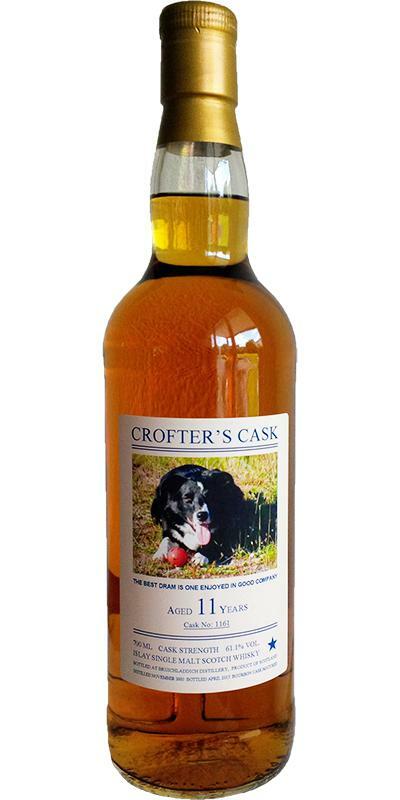 Crofter, a dog who entertains his owner Steve and other Islay visitors over the years is featured on a private bottling done by Steve, both in title and label, and I’m sure Crofter contributed a lot to the success of this 11 year old Bruichladdich by sniffing out the right cask. Or maybe it’s just because Steve worked there and knew which cask to select? Nose: Very clean, lots of minerals, melon and honey, dusty when sniffed neat, very little peat and smoke, salt. Palate: Boom! Zesty, greenery, mineral, dash of peat, sweet fruitiness with lots of ripe melons, honey, a few drops of lime juice and totally very crisp. Finish: Short medium, lingering sweet honeyed melon, mineral-y and greenery. Thoughts: Really good stuff. An young whisky yet it carries an excellent example of classic Bruichladdich character (minus the lactic stuff). Great cask selected by Crofter.. er.. Steve. This entry was posted in Whisky Reviews and tagged Bruichladdich on June 27, 2017 by Yoav @ Whisky Gospel.